"Sampath Speaking" - the thoughts of an Insurer from Thiruvallikkeni: the gigantic Satao is no more ~ killed by greed of man !! the gigantic Satao is no more ~ killed by greed of man !! I have many times professed my love for the gigantic mammals - one of the many things that strikes the visitor to Kerala, is its rivers, abundance of coconut trees, big and powerful tuskers that could be seen walking on the road and sometimes being carried in trucks… Elephants are majestic and tuskers with their height and beautiful white ivory tusks captivate…. I had earlier posted of a valued mammoth, reportedly the second tallest elephant in Asia -Thechikottukavu Ramachandran, owned by Thrissur Thechikkottukavu Peramangalthu Devaswom. This is no post on Indian elephants but something miles away…. During colonial times, elephant hunting in Kenya was seen as a sport for noblemen and was exploited by the colonial governors. Among the game hunters, the bull elephant was said to be the most exhilarating form of elephant hunting. Small-bore rifles appeared to be the preferred option and aiming at the brain instead of the heart was another preference, though the motive was not always monetary for many of the hunters. Modern day poachers are indiscriminate in their choice of elephants to kill – young, old, male or female, it did not matter, as the primary purpose is ivory. Elephant hunting or elephant poaching and exploitation of the ivory trade are illegal in Kenya and pose a major threat to elephant populations. According to elephant enthusiasts, so far this year close to 100 elephants have been killed in Kenya ! Conservationists view lenient penalties by the Courts as major setbacks in the fight against poaching. 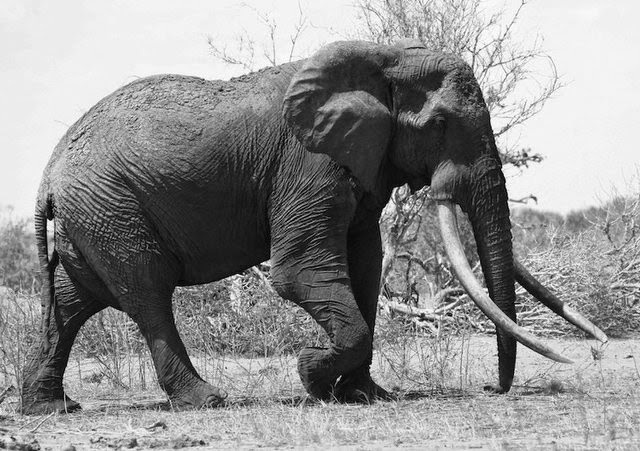 Sad to read that a 50 year-old elephant named Satao, one of Africa’s last ‘great tusker’ elephants, has been killed by poachers in Kenya. According to a press statement issued recently by Tsavo Trust, a Kenyan-based Non Governmental Organization that works to protect the security of wildlife, Satao was shot dead by poachers using poisoned arrows on the 30th of May, 2014. ‘A great life lost so that someone far away can have a trinket on their mantelpiece,” the statement said. The poachers cut off the elephant’s face and stole the tusks, but conservationists who have studied Satao for several years identified his body from the ears and other marks on this body earlier in June and immediately reported to authorities. Satao was famed for his giant tusks which weighed more than 100lbs and were so large they were easily identifiable from the air and touched the ground. He spent the last 45 years of his life roaming around the Tsavo East National Park, a large park located in Southern Kenya, but the giant bull had in recent weeks relocated to the boundary of the national park to find new vegetation and fresh water. The major perpetrators of killing elephants are organized crime syndicates and rebel militia looking for ways to fund insurgencies in Africa while the biggest market for this illicit ivory trade is Asia where tusks sell for several thousands of dollars a kilo. The Asians are believed to use the Ivory in decorations and traditional medicines. Only last month, poachers killed an elephant famously called ‘Mountain Bull’ in Mount Kenya. His carcass was discovered with spear wounds while the tusks had been carted away. Kenyan authorities have estimated that close to 100 elephants have been killed by poachers this year alone, but conservationists believe the number is grossly underestimated. Tsavo Trust is a Kenyan non-profit organisation working in support of wildlife, habitat and communities in southern Kenya's Greater Tsavo Ecosystem. It proclaims that they do this through the development of Community Wildlife Conservancies, which address the human factors leading to the destruction of wildlife and the environment, as well as through direct wildlife conservation projects. Tsavo is one of East Africa's largest and most important natural habitats and is a valuable economic and environmental asset for Kenya. Remember that in 1970s, a movie by name ‘King Elephant’ ran full houses…. it was originally ‘African elephant’ – a straightforward, well-photographed documentary concentrating on the elephants of Africa. The filmmaker Simon Trevor focussed on the more curious aspects of elephant life. In addition to the mighty pachyderm, there were intriguing glimpses of other forms of African wildlife. Sad to read the death of a mighty mammoth. Photo taken from dailymail.co.uk ... article posted a bit earlier.